Health Care REIT’s gleaming new office center in Ohio was just awarded LEED Platinum certification by the U.S. Green Building Council. 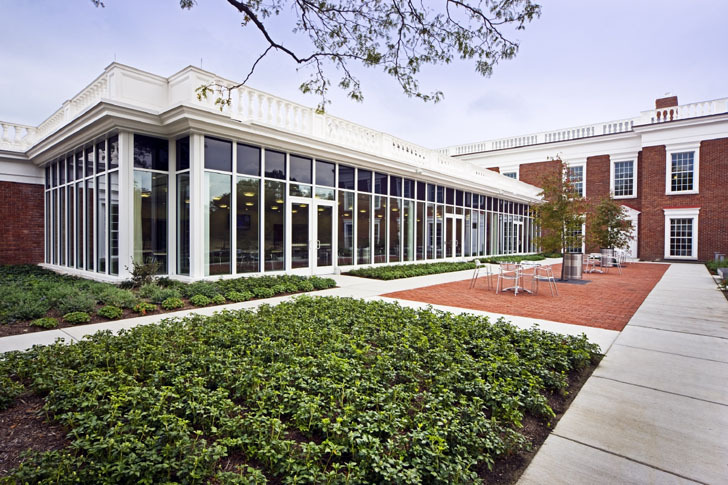 The colonial-style complex was designed by Centerbrook Architects in collaboration with + Duket Architects Planners of Ohio and is set on a grassy hill. The new complex has renovated a forty-year old building, updating it with modern green standards. The rehabbed Healthcare REIT Building is only one of nine LEED Platinum Buildings, out of 212 LEED Certified buildings in the state. The colonial façade, complete with Doric columns, welcome visitors to the energy-saving complex. Centerbrook and Duket installed a green roof system on the existing structure, which filters rainwater and protects the interior from solar gain. Windows and skylights were added to ensure optimum natural lighting throughout the entire complex. A solar photovoltaic array was also added to the roof, to help power the building’s energy needs. The complex also features a retention pond, thermal storage and solar thermal panels that save energy used for heating. Sustainable wood was used in construction throughout, and an intensive recycling program has been integrated into day to day operations. The building’s energy consumption is monitored and controlled through real-time metering and automatic controls. Combined, these features greatly reduce the overall energy, water, and electricity consumption – in addition to a 78% reduction of construction waste and a 100% reduction of potable water for irrigation. Aside from the traditional green features, the Health Care REIT facility has a state of the art telecommunications system that allows employees to “meet” regularly and remotely. This sophisticated structure saves employees time and energy that would be spent on commuting. Health Care REIT’s office campus was designed to make employees comfortable, and to thrive in a healthy working environment. The rehabbed Healthcare REIT Building is only one of nine LEED Platinum Buildings, out of 212 LEED Certified buildings in the state. 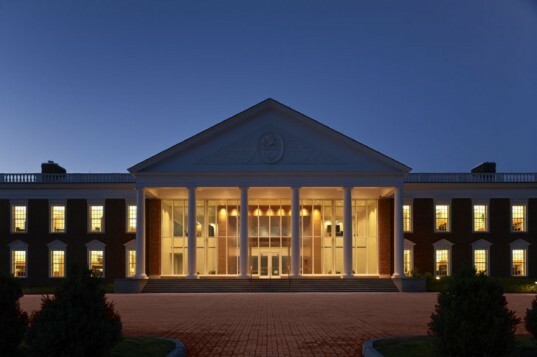 The colonial façade, complete with Doric columns, welcome visitors to the energy-saving complex. Centerbrook and Duket installed a green roof system on the existing structure, which filters rainwater and protects the interior from solar gain. Windows and skylights were added, and constructed in the additions to ensure optimum natural lighting throughout the entire complex. A solar photovoltaic array was also added to the roof, to help power the building’s energy needs. The complex also features a retention pond, thermal storage and solar thermal panels, which save heat energy usage. Sustainable wood was used in construction throughout, and an intensive recycling program is utilized daily. The building’s energy consumption is monitored and controlled through real-time metering and automatic controls. Combined, these features greatly reduce the overall energy, water, and electricity consumption, in addition to a 78% reduction of construction waste and a 100% reduction of potable water for irrigation. Aside from the traditional green features, the Health Care REIT facility has a state of the art telecommunications system, which allows employees to “meet” regularly and remotely. This sophisticated structure saves employees time and energy that would be spent on commuting. Health Care REIT’s office campus was designed to make employees comfortable, and to thrive in a healthy working environment.